How to save money can be fun, too, especially with these six DIY ideas to dress up your living room. We culled some of the more interesting DIY projects with each one to complete a living room set. From the major pieces to the accents, these pieces are meant to add color to your living space, sans the cost if you buy a counterpart from the furniture store. Besides, what is a better way to de-stress and spend a weekend away from office deadlines than dive into a DIY project? So take out the tools and lose yourself in these projects, most of them are simple enough for a novice. This idea doesn’t only save you money; its saves space, too. We didn’t realize that the little area between the sofa and the wall can be turned to a table until we came across this blog. The practical uses are not a few: as a bookshelf; dashboard for living room accents; and base for a lampshade to help you read in the comfort of the sofa. The materials are basic, from screws to brackets, and you just need a few tools, such as drills and screw driver. The project is basic at most and we suspect you can finish it in a day. This is another great idea to save space while saving money. The sofa doubles as a storage box just for anything you can think of. The author suggests it is good for putting in your extra pillows and bed sheets. Building a sofa is not simple and it is expected (or hoped) that you have a good background in DIY projects. Sofa making involves upholstery, so expect to dish out some sewing skills. But the author gives a detailed procedure that even a first-timer can follow, albeit not without a few questions. Feel free to ask the author and we expect she’ll be happy to respond. 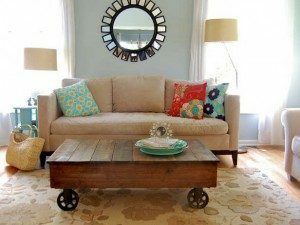 We love the rustic aura of the coffee table, a recycled combo of wood and caster wheels that you can get in a junk shop (feel free to use a new item, though). It’s a coffee table that can double as a centerpiece depending on your living room layout. The author suggests that you choose wood with imperfections—cracks, smudges, knots—to give your table a character. The whole project may require a more developed carpentry skills and use of tools, but worry not, nothing in DIY is impossible to learn. You can also ask the lumber shop to help you cut the required specs for the wood. It’s simple enough and quick to finish that can add warmth to a bare wall. The wall shelf is versatile and can be used for books, decors, vases, antiques, and photo frames. The cost is estimated between $20 and $100 depending on the materials. Feel free to change the color or type of the wood to match your wall. A note though, you may need some specialized tools to carve the wood, such as a miter saw and finish nailer. We like the author’s tip of using scrap of quality lumber instead of buying a whole piece to cut costs. Here’s an innovative way to dress up the living room: a fabric mounted on wall. It’s a way to wait out for that perfect family portrait or commissioned painting, the author puns. We agree; the fabric wall piece exudes a first-class hotel feel especially if you go for intricate patterns or old Asia designs. The procedure cannot be simpler: a staple gun, canvas, and, of course, fabric are all you need and you can create as many pieces as you can. We suggest though not to overdo it. The fabric piece is meant as an accent, not to dominate the living room. The website has excellent tips on how to re-use or re-invent things for living room decors and accents, such as making a chandelier out of a bird cage; using empty ostrich eggs; and using bowls as photo and postcard holder. The site even links you to webstores that offer the cheap items featured in the DIY projects, so ordering online is made easy. Enjoy a plethora of ideas for slipcovers, lamps, coffee table accents, and curating objects and artworks to create themes. DIY projects are not only often cheaper, but they have a psychological effect of giving you a sense of fulfillment and purpose. DIY has a charm that is not far off from, perhaps, achieving peace of mind in a solitary monk house in Tibet. You get the picture. DO YOU HAVE A GREAT DIY IDEA FOR THE LIVING ROOM? SHARE IT HERE AND WE MAY FEATURE IT FOR OUR READERS. What is the best project management book?